The University of Manchester is hosting the 2010 World Lacrosse Championships, which begin in the city later today. England may have disappointed many fans with their early World Cup exit, but England’s lacrosse players are hoping to restore some national pride. The World Lacrosse Championships are being held at the Armitage Centre in Fallowfield as the University hosts the biggest sporting event seen in the city since the 2002 Commonwealth Games. The international tournament runs until July 24 with a record 30 countries taking part – that’s nine more than in 2006 when the World Championships were held in Ontario. A Community event will also run alongside the Championships featuring local primary, secondary and club teams. The countries taking part include Argentina, Australia, Austria, Bermuda, Canada, Czech Republic, Denmark, England, Finland, France, Germany, Hong Kong, Ireland, Iroquois, Italy, Japan, Latvia, Mexico, Netherlands, New Zealand, Norway, Poland, Scotland, Slovakia, South Korea, Spain, Sweden, Switzerland, USA and Wales. The Iroquois team are thought to be the only tribal nation taking part in any type of World Cup, reflecting the Native American origins of the sport some 700 years ago. 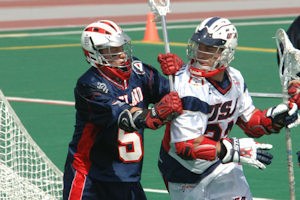 Canada are the defending champions having defeated the United States 15–10 in the 2006 Final. This will be the third time that the tournament has been held in this region; Stockport hosted it in 1978 while Manchester played hosts in 1994. Stockport has become the home of British Lacrosse since a tour of the UK by a Canadian team in the late nineteenth century. One of the early highlights will be ‘Super Saturday’ this weekend, which is already a 5000 capacity sellout, when England face Australia and Canada take on the USA in a repeat of the 2006 final. The Opening Ceremony begins this afternoon at 5.30pm.